Posted on October 25, 2005 by Mark A.
I realize I may very well be the only person on the planet who simultaneously subscribes to Entertainment Weekly while maintaining a membership with the Modern Language Association. I’ve come to terms with the fact that I’m a multi-faceted nerd. Anyway, since most folks I know don’t subscribe to that bastion of journalism Entertainment Weekly, I thought my readers should know that in the October 26th issue EW an article on “Watchmen” appears. In 1984 DC comics asked Alan Moore to reinvigorate a group of comic characters that hadn’t been popular in decades. They gave Alan Moore the creative freedom to do whatever he wanted with the characters, and the 12 issue story arc that followed, titled “Watchmen” written by Moore and illustrated by Dave Gibbons transformed the way readers viewed comics. The story was complex, political, and quite timely. Everything comics had never been before. Frank Miller’s defining run on Batman had already appeared and was one of the first comics intentionally marketed for a mature audience, but Moore crafted a world much more complex and literary than Miller had ever dreamed of creating. In the interview in EW Dave Gibbons recalls that each issue script was over 150 pages. An average comic script clocks in at around 30-35 pages. 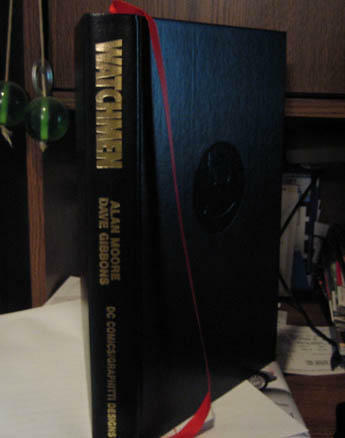 If you consider yourself reasonably well read but have always looked down on comics as inferior to canonized texts, I urge you to pick up “Watchmen” and discover Moore’s fully-realized, rich and complex world. You won’t believe how relevant the material in the comic is to our present political and social climate. Well, at least I’m not a Trekkie.